Water Quality in Singapore: Is it possible to DIY your own water collection, treatment and usage systems? Is it possible to DIY your own water collection, treatment and usage systems? But before you commit yourself to a probably "think in the box" kind of thought error, open your mind and consider the following series of "Off-grid autonomous water system" workshops organised by The Substation. Joining them actually provides you the chance to DIY all 3 steps for water self-sufficiency - collection, treatment & usage! 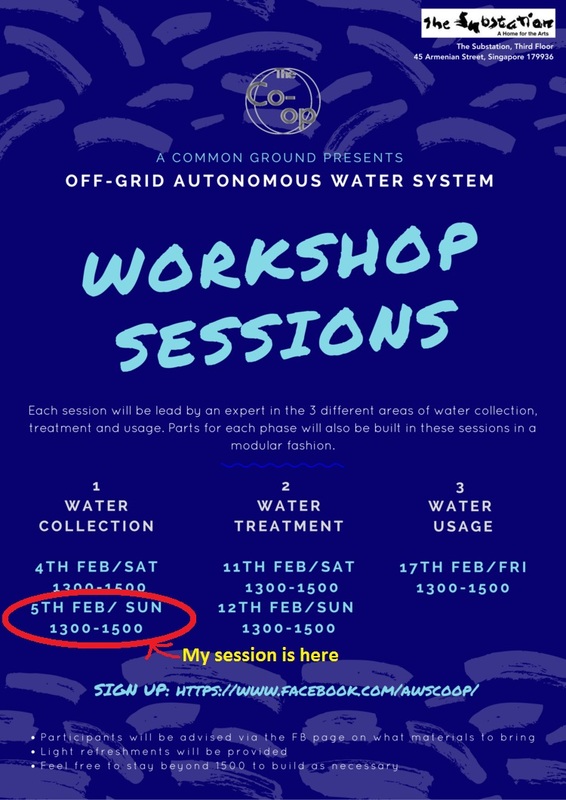 I have the honour to be invited to one sessions (5 Feb 1300-1500) to share on my experiences on rainwater harvesting and grey water recycling in SP some time back. I believe it will be inspiring for them to realise that there are various interesting way to obtain water than is normally taken for granted in Singapore.